In recent years, Australian governments and fishing industry associations have developed guiding principles aimed at reducing the impact of fishing on non-target species and the benthos and increasing community awareness of their efforts. To determine whether they reduced seal entanglement in lost fishing gear and other marine debris, we analysed Australian sea lion and New Zealand fur seal entanglement data collected from Kangaroo Island, South Australia. Contrary to our expectations, we found that entanglement rates did not decrease in recent years. The Australian sea lion entanglement rate (1.3% in 2002) and the New Zealand fur seal entanglement rate (0.9% in 2002) are the third and fourth highest reported for any seal species. Catching the seals to release the nets and tape. Australian sea lions were most frequently entangled in monofilament gillnet that most likely originated from the shark fishery, which operates in the region where sea lions forage - south and east of Kangaroo Island. 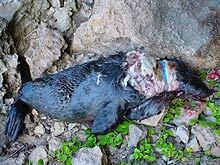 In contrast, New Zealand fur seals were most commonly entangled in loops of packing tape and trawl net fragments suspected to be from regional rock lobster and trawl fisheries. Based on recent entanglement studies, we estimate that 1,478 seals die from entanglement each year in Australia. We discussed remedies such as education programs and government incentives that may reduce entanglements. For a seal in the middle of the ocean, a loop made of plastic or rope is something to throw around to help pass the time, but the seal doesn't realise that such toys can kill. The seal doesn't see it coming and doesn't understand where the loop disappears to, but as the seal swims off the loop of rubbish starts constricting around its neck. La Trobe University PhD student Brad Page, who is researching the effect of lost fishing gear on New Zealand fur seals and Australian sea lions, estimates that this happens to about 1500 seals in southern Australia each year. Although most of the debris we find entangling seals is from the fishing industry, we have removed several plastic bags, a string of burst balloons and a few rubber o-rings. If a seal is lucky it has picked up a loop biodegradable packing strap, which starts off around fishers bait boxes, and the seal may get a second chance if the loop rots and breaks off its neck. Unable to catch fish thanks to the added drag caused by the rubbish, the rubbish also cuts a painful, gaping wound that will fester and never heal. Left alone in this condition the seal would die within a few weeks and the piece of plastic would eventually blow around the colony and possibly catch another seal. While the death of some seals from the accidental loss of fishing gear is unavoidable, some fishers do not understand that lost fishing gear causes slow and painful deaths to many marine animals. The rescue of entangled seals by La Trobe University researchers appears most unwelcome as the suffering seals dash for the water, only to be caught like a vagrant dog in a dog-catcher's net. The seals bite the net as the La Trobe University researchers cut the loop and tear the rubbish out of the seals' flesh. Brad Page believes that so many Australian sea lions die in this way that lost fishing gear may be one of the major factors keeping the sea lion population stable at around 11500 for the last 15 years - a period when neighbouring fur seal populations have been rapidly increasing. Most of Brad's PhD focuses on seal-fishery competition for the fish and squid that we enjoy eating as much as the seals. To assess levels of competition between seals and fishers Brad has been tracking seals to determine where they feed and sieving seal scats to find out what they eat. Amazingly, New Zealand fur seals don't take many fish that we find on our dinner plates. Seals prefer a small fish called red bait as well as squid and little penguins. One seal had even eaten a 2kg Australasian gannet! My interest in individual seal welfare developed as a time-consuming passion from working on seals in remote, untouched wilderness reserves such as Heard, Macquarie and Kangaroo Island, where catching entangled seals can be a weekly event. Over the last few years the Commonwealth Government and fishing industry associations have developed guidelines for commercial fishers, to help reduce this unaccounted fishing mortality and the impact of fishing on the rest of the marine environment. Unfortunately these guidelines have not reduced the proportion of seals getting entangled in rubbish each year, with numbers of entangled seals actually rising in recent years, from one in three hundred to more than one in a hundred seals at colonies on Kangaroo Island in South Australia. The La Trobe University researchers have an exciting, exacting and occasionally dangerous job in trying to save some of these seals. Sprinting across jagged rocks after injured seals that are terrified because they think they're going to be killed has resulted in some serious injuries to the would be captors, but they manage to catch two in every three that they find. Dumped or discarded fishing gear proved fatal. After receiving funding from 11 interested organisations, Brad produced and disseminated, between March and June 2003, 10000 brochures to commercial fishers operating from Sydney to Broome, advising them of the hazards of the fishing gear they lose in the sea. The fishing industry associations, State Government Fishery managers and most commercial fishers have been very encouraging of the project as they understand its only a few rogue fishers that are dumping rubbish at sea. We are still trying to get the pamphlets to some fishers in the Commonwealth sector. One rock lobster fisher even called me and asked for some posters to display in the pub on Kangaroo Island. The La Trobe University study, which will be published in the Marine Pollution Bulletin, recommends that governments provide incentives to bait packing companies to use biodegradable packing straps on bait boxes and to fast-track research to determine how so much monofilament netting is ending up around the necks of Australian sea lions and quantify its effect on the sea lion population. For example, the removal of packing tape from the fishing industry will prevent entanglement of more than 300 seals in Australia each year. International laws prohibit dumping plastic rubbish at sea. Radio beacons on 'longline' fishing gear to help them be located. The Australian Maritime Safety Authority, Emergency Response Rescue Coordination Centre (RCC) has a 24 hour hotline. Fishing vessels must make every effort to retrieve all lost or damaged fishing gear. Also by reporting the approximate position of lost gear, other vessels may be able to pick it up. Biodegradable bait bags or tubs. Placing a weaker material in the headrope to help reduce wildlife entanglements. Galvanic Timed Releases, anodes fitted to fishing traps. These decay and allow a movable panel to open up. Once this has occurred the lost trap can be considered safe.